Three Billboards Outside Ebbing, Missouri: does Sam Rockwell deserve awards for playing a racist? — Harpy. “It seems to me the police department are too busy torturing black folks to solve actual crime,” says Mildred Hayes (played by Frances McDormand) in Three Billboards Outside Ebbing, Missouri. In this darkly funny drama from Martin McDonagh, Mildred Hayes is a grieving mother who hires provocative billboards to pressure the local police department into solving the case of her murdered daughter. Three Billboards is about grief, but with the backstory of police brutality, it’s clear that this is also a film with a point to make about racism. McDormand’s performance is staggering, capturing Mildred’s heartbreak in all it’s vacillations between crotch-kicking anger and poignant regret. She handles a script of obscenities with stone-cold expertise, while the audience is torn between standing up and cheering, or hanging their head in shame out of solidarity with her teenage son (played by Lucas Hedges). McDormand picked up her well-deserved ‘Best Actress’ award at the Golden Globes earlier in January, and is predicted to be among those nominated at the Oscars. It is her co-star Sam Rockwell, however, who dominates the conversation surrounding this film’s Oscar nominations. Rockwell has already come under fire after his portrayal of racist police officer Jason Dixon won ‘Best Supporting Actor’ at the Golden Globes. We are led to believe that Officer Dixon is responsible for the torturing of “black folks”, although he is not specifically named by Mildred Hayes when she calls this out on live television. Officer Dixon is intolerant, violent and cruel, behaving in ways that had me hand-over-mouth in horror at times. It is reprehensible, according to the backlash online, that such a character could lead to an Oscar win. However, Rockwell’s performance is undeniably worthy of accolade. There is something visceral in the extremes of emotion that he manages to produce in the audience member watching Three Billboards, not least because he embodies the swaggering ignorance and strength of conviction that reminds us of every white male racist in a position of power we have ever seen. 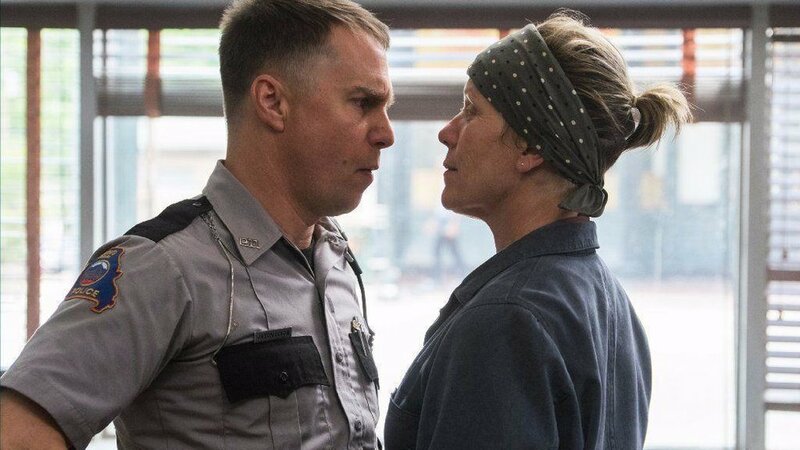 Mildred Hayes (Frances McDormand) squares up to Officer Dixon (Sam Rockwell). Images for this post provided by Fox Searchlight Pictures. It is certainly a script that challenges the natural desire to ‘pick a side’ or identify with one character over the others. While this kind of film-making has the capacity to overturn our preconceptions and be truly moving, there is still plenty of room for criticism in McDonagh’s approach to racism in Three Billboards. The selection of black storylines that McDonagh chooses to use beg us to question the statement being made about racism. If you’ve yet to watch Three Billboards, I’ll warn you that the following contains some spoilers. Though none of the starring roles are played by people of colour, four black characters occupy interesting moments in this story. First, the unnamed black male arrested and reportedly tortured by Officer Dixon. His story weaves in and out of the background, providing a backdrop of racially-charged hatred. This, we assume, is why Jerome (played by Darrell Britt-Gibson) spits at Dixon when he is approached by the police officer at the foot of one of Mildred’s billboards. Jerome is our second character, whose decision to spit at and behave provocatively towards Dixon sent my eyebrows shooting upwards in disbelief. I’m not sure how much I believe that a young black male, without the protection of a single witness, would risk behaving in such a way towards any police officer let alone one that is known to be racist and violent. This is either a huge oversight in the script, or McDonagh deliberately puts Jerome in a threatening situation with the intention of encouraging the audience to think about police brutality towards people of colour. The narrative will go on to show the arrest of Denise, a black female shop-owner, being used to threaten Mildred Hayes. Soon after, a black Chief of Police will dole out justice just as things seem to be getting out of hand in Ebbing. It’s fairly believable that a police department could go as far as framing a black woman for the possession of marijuana as a means to ‘get at’ those close to her, but then why must McDonagh cheapen this otherwise wry move by suggesting that Denise and Jerome start dating? Like a white family’s racist grandma, the film cheerfully assumes that two people of colour not only know each other, but must also be hooking-up. Sloppy... Furthermore, that a black Chief of Police must ‘save the day’ feels patronising. Black people are not here to solve our little racism problem. The disgusting behaviour that the Chief steps in to rectify should have been rectified by any one of the numbers of white police officers already in a position to do so. It is clear to me that McDonagh wants to highlight the fact that institutions like the police force are rife with racism, and people of colour are not protected by them. Of course, it would be huge misfire were he to have made the very central characters of Three Billboards non-white, as a white person himself with no authority to accurately tell those stories. If we want films that go beyond the clumsy attempts of white script-writers and directors to tell black stories, we need to work harder to overhaul Hollywood as one of those institutions in which racism is still all too prevalent. When we allow more people of colour into the hallowed inner circles that determine how media reflects our actual lives, then we’ll find that the stories of people of colour are being told more accurately. There are some stunning performances to be seen in Three Billboards that do justice to a script that is touching, horrifying and hilarious. I certainly don’t agree that Sam Rockwell’s performance should go unrecognised, nor do I think that awarding this film in any way redeems the grippingly awful behaviours it depicts on screen. We must trust, as an audience, that being moved by the stories of people who do bad things does not make us condoners of bad behaviour. Humanity is complicated, and to have art that reflects that complexity brings us closer to empathy with all people.